What do you expect for $28,890? Depending on where the emphasis is placed, that question is either a curt challenge to your perceptions or an earnest request to know your desires. 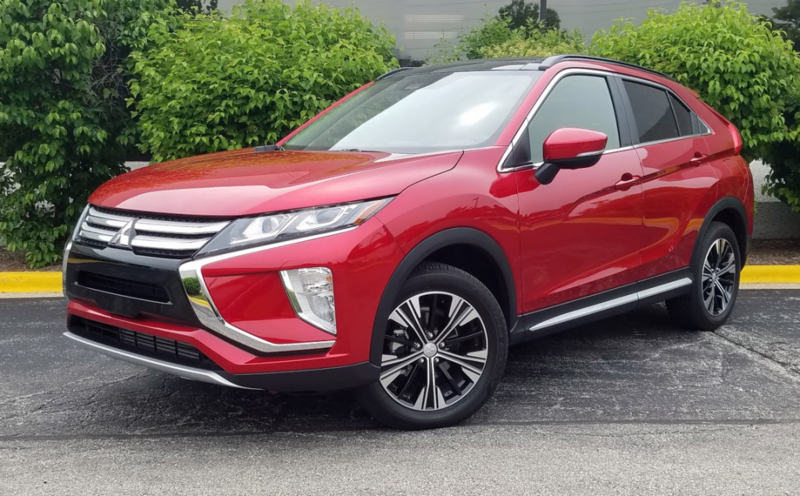 If the question is raised in a conversation about compact crossover sport-utility vehicles, it most certainly is about Mitsubishi’s new Eclipse Cross. Eclipse Cross’s back glass is divided by the taillight assembly–a nod to style that compromises the driver’s view to the rear of the car. SELs roll on 18-inch alloy wheels and sport heated power mirrors, rain-sensing windshield wipers, LED headlights and taillights, and chrome side-window trim. Inside, the seats, tilt/telescoping steering wheel, and shifter knob are clad in leather. Front seats are heated, and the driver’s seat is power adjustable eight ways. The audio system is AM/FM with satellite and HD radio; climate control is dual-zone automatic. Convenience and connectivity features include a 7-inch touchscreen with touchpad controller for audio, apps, and Bluetooth phone management; Apple CarPlay/Android Auto functionality; head-up display; 360-degree camera; keyless access and starting; blind-spot and rear-cross-traffic alert; and the new Mitsubishi Connect telematics system that links to emergency and road-side assistance, remote climate control and door lock/unlock, car finder, and parental controls. In terms of passenger space, cabin materials, and general ambience, Eclipse Cross falls squarely midpack in a very competitive category. We are disappointed that the head-up display screen–seen here forward of the steering wheel–does not tilt far enough up to be useful to drivers over 5′ 10”. Things like forward-collision warning and mitigation, adaptive cruise control, and automatic high-beam headlights are available, but only on the SEL through an extensive Touring Package option. That $2500 group and a trio of stand-alone options fattened the bottom line of CG’s test vehicle to $32,310. So, then, how does it all work? That’s going to influence your expectations for a small SUV of $29,890—or $32,310. Eclipse Cross’s second-row seats do not fold completely flat, but laid flat open up a generous volume of cargo space. Included with the available Rockford Fosgate audio system, the cargo-bay-located subwoofer is situated to consume as little storage capacity as possible. The test truck’s ride wasn’t bad, even on well-broken-in city streets. Handling was less impressive. When taking corners even at moderate speeds there was a tendency toward oversteer. Steering is light through most of the wheel’s travel, and it’s easy to slip nimbly into a parking space. Steering feel practically evaporates on center. 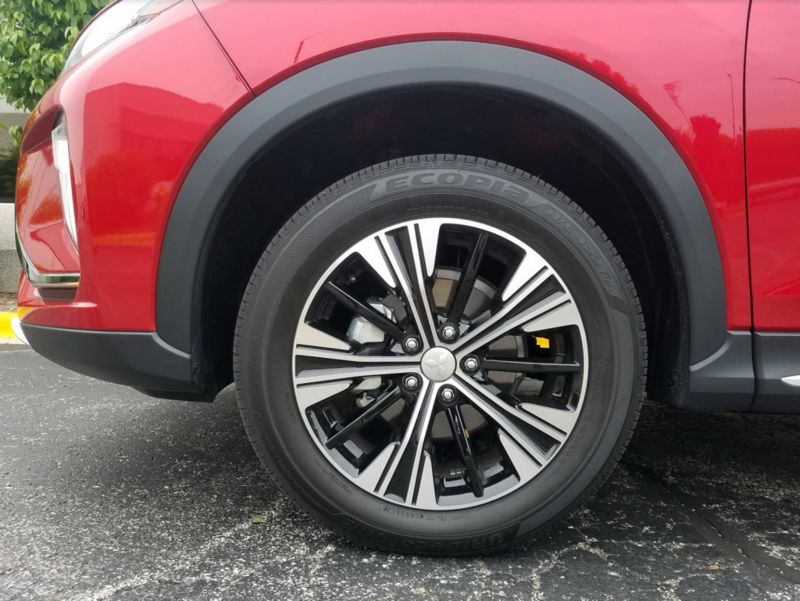 Eighteen-inch alloy wheels are standard on three of the four available Eclipse Cross trim levels, though each boasts a unique design. The interior does present enough room for adult-passenger comfort in both rows at the same time. Headroom is good, even under the dual-pane sunroof that comes in the Touring Package. Cushions that adjust fore and aft, and backs that recline further rear-seat comfort. Padded soft-touch material shows up on the top of the dash, front-door tops, and all armrests. The biggest challenge to driver vision is straight back through the two-pane window. 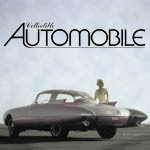 (Think hybrid or EV hatchback.) A horizontal extension of the taillights runs through the meeting point of the two panes. The centrally controlled touchscreen is trying to imitate what goes on in much swankier vehicles—and with about the same degree of “efficiency.” The console touchpad seems oddly disconnected from actions on screen. (This driver would press on one corner, then another, but rarely did something happen on the screen, and when it did, the significance of it was mostly incomprehensible.) Fortunately, radio presets and other inputs can be made directly and correctly through the screen. Climate controls rely on repetitive-push buttons for everything, including temperature settings. Curiously, the temp buttons are sited within circular areas that would each be big enough for a handier rotating dial. At least ancillary controls are well placed, and driving instruments—including the vehicle-information display, are easy to read. Cabin storage is just handy enough. There’s a large glove box, a moderately sized two-tier console box, a large bin in the forward portion of the console bin under a 12-volt plug and two USB inputs, and pockets in the doors—though in back they are confined to bottle holders. A pouch is attached to the back of each front seat. There are two cup holders in the console and two more in the pull-down armrest in the middle of the back seat. The Eclipse Cross declares its sporty (for a crossover) intentions with a sharply sloped profile. The angled portion of the roof is right over the cargo hold, and it limits capacity somewhat. Still, there is nice storage space for the vehicle’s size. The second-row seats fold in a 60/40 split, but they don’t rest perfectly flat. At least there is an unbroken surface from the cargo floor to the retracted seats. 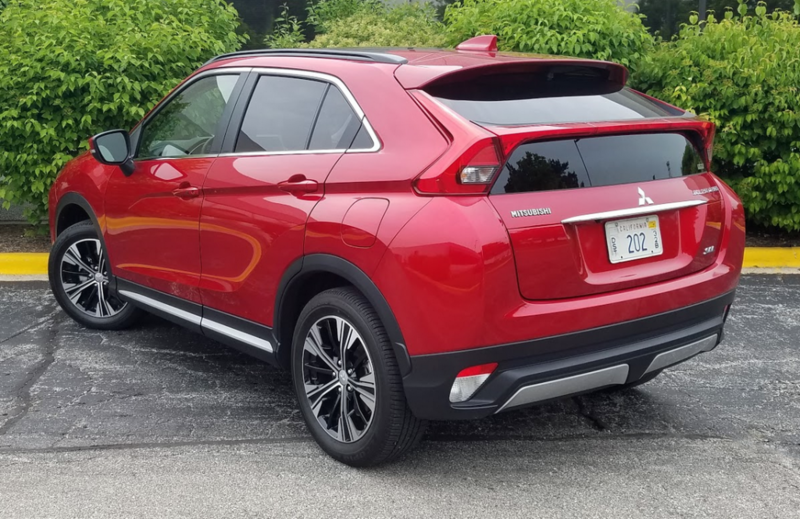 To get desirable features in Mitsubishi’s new small crossover requires going for all the Eclipse Cross there is. The SEL may be more than most folks’ expectations, which can still be met more economically—and realistically—a little further down the product line. Eclipse Cross’s chiseled contours are best realized in profile. Mitsubishi positions the “Cross” in its lineup between the subcompact Outlander Sport and compact Outlander. Written by: The Daily Drive staff on July 31, 2018.on August 2, 2018.